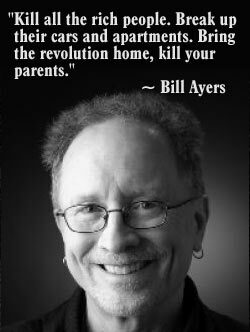 One of Obama’s mentors, domestic terrorist Bill Ayers, spoke at the annual commemoration of the Kent State shootings over the weekend and sought to justify his domestic terrorism from the 60′s and 70′s when he and his terrorist group, Weather Underground, engaged in bombings of New York City Police Headquarters in 1970, of the Capitol building in 1971, and the Pentagon in 1972. 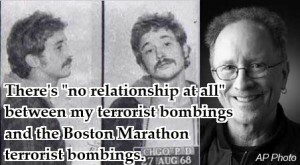 Ayers said that to compare his bombings to that of those at the Boston Marthon was not fair. “Just because they use the same thing, there’s no relationship at all,” Ayers said. Ayers speaks as if it was OK to destroy property. He seeks to justify his criminal behavior here and yet was the keynote speaker at the event. So Ayers’ hands are not clean in the matter. He had murderous intentions, just as those who detonated the bombs in Boston did. In fact, he was a fugitive running from the FBI, along with his then girlfriend Bernardine Dohrn. They finally surrendered in 1980, but all charges were dropped due to an “improper surveillance” technicality. Apparently a warrant had not been issued for some of the surveillance. It’s interesting how far we’ve come, in America. Ayers said his wife, Bernardine Dorhn, also a prominent former member of the Weather Underground and now a Northwestern University law professor, spoke several years ago at a Kent State May 4 commemoration. Well, just where is that “hard moral responsibility” when you are determining to not only blow up property, but you have the premeditated thought process of murdering scores of America’s Armed Forces that have done nothing to you? Ayers is believed to have written Barack Obama’s 1995 fictitious memoir Dreams from My Father, according to evidence. Perhaps his ties in Chicago is what kept him out of prison, got him a lofty job as a university professor and even got him into the White House. Ayers hates America with a passion only someone like Barack Obama could appreciate. “What a country. It makes me want to puke,” he said in 2001. I think I could say the very same thing about Bill Ayers.